All numbers are UK except those which start 00 34 which are Iberian. If telephoning the UK from abroad, remove the 0 and add +44. So the webmaster’s fax number 01342 850864 becomes +44 1342 850864. If faxing within Europe this becomes 00 44 1342 850864 If you would like to tell a friend about this vacation rental holiday accommodation file, give them the URL address http://www.info-world.com/spain/rentals . Email or fax if you would like your property advertised on this list or an advertising page constructed at economical rates. LAST MINUTE BOOKINGS IN AUGUST: Please note - most places are booked for August at least 6 months in advance. You may be lucky and get a cancellation - but please EMAIL where indicated and DO NOT TELEPHONE PEOPLE IN JULY AND AUGUST. However, you might try the email links below, and also try new entries here in Mallorca, the Costa Blanca, Costa Brava, Northern Spain and the South of France which have not yet been entered on this file. If you are flying out of Gatwick or Heathrow airports here are useful places near both airports to spend the night before the flight. Many English travellers stay here if they have a 7am flight and have to be at the airport at 5am. Here's tourist information for the UK, Italy and Iberia. 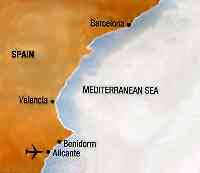 Here's Spanish tourism links to Benidorm and the Costa Blanca . Here's Madeira Island tourism info More Spain tourist links will follow! Please CLICK HERE for the up-to-date version of this file with latest details of accommodation and new properties added. The webmaster regrets that due to the unreliability of ftp access to this server this file is not regularly updated. Please come to http://www3.mistral.co.uk/latrobe/lodgings.htm. New properties have been added near Moraira, Benidorm, Javea, Mallorca, Barcelona, Blanes, the Costa Brava and the Costa Blanca. Some properties listed below may not be still available. Please do not telephone any of the numbers given below but click here instead. Please do not contact villa owners listed below: please check out the updated version of the file here which is constantly updated. , MOJACAR. - 2 bedroom linked villa. Fully equipped. Terraces, pool. Quiet area. Panoramic views. - Tel. 01772 421295. NEAR MOJACAR. - Mountain village overlooking Mediterranean. Detached luxurious cortijo in 3 quiet unspoiled acres. 5 minutes beaches, restaurants. 3 double bedrooms ensuits, luxury kitchen, air conditioning, fans, TV, Hi-Fi, 3 terraces, gardens, private pool. £800 pm Jun-September. - Tel/Fax. 00 34 50478823. MOJACAR AREA. - Superb private 2/3 bedroomed villas on quiet coastal urbenisation, Satellite TV. Pools. Restaurant. Spectacular mountains. Tel. 01872 510208. MOJACAR. - 2 bedroomed apartment. Pool. Close to beach/amenities. -Tel. 01785 819507. 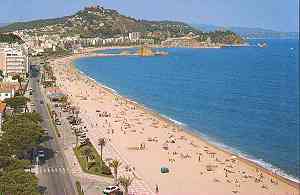 Here's another lovely place for a good holiday further south on the Costa Blanca, south of Benidorm. 10 MILES COAST. - 3 doubles, 2 bath, own pool. View mountains, Mediterranean. Winter from £350, Summer from £400.- Tel. 01458850281. - Author's period house with garden and orange orchard. Jacuzzi, 2 double beds. cot, maid, sleeps 8. Video available. -Te), 0181-4693972. - Farmhouse and cottages in nature reserve. Sleeps 2-16. Pool. - Tel. 01892 668090.
. - House in lovely mountain village. Terraces, views, CH. - Tel. 01386 792306. - River house, walled garden. Pool. Sleeps 8. Near village. - Tel. 01892 668090.
barbecue, TV. £280-£550 pm. -Tel. 01773540118. CASARES (NEAR ESTEPONA). - Beautiful hillside villa, 3 double bedrooms/bathrooms, own pool. Gibraltar, sea views. - Tel. 01572 737263. COMPETA. - Peaceful villa in hills, nine miles from Neria beaches. Magnificent views. Private pool. Sleeps 4. - Tel. 01242 580066. TORREVIEJA. - Villa near town, beach. On-site administration. - Tel. 01394382098. ALICANTE, SPAIN. - Seafront 3 bedroom flat. Sleeps 6. £65-£l9Opw. - Tel. 01803 712477. 2 bedroomed, fully equipped reasonable rates. tel. 01382 521444 or email here aileen@rosling.com. Moraira is an especially attractive traditional village with lots of local charm. It is near to Benidorm with the best climate on the Mediterranean but with no hideous concrete in sight! Click here for further details. - Luxury apartment, two private pools, beautiful landscaped gardens. –Tel 01452813755. - Lovely villas, apartments, near beach. - Tel. 0181-5411030 or 00346 6490347. Secluded, 4-14 beds, pool. Stunning sea view. Beach 400m. Shops 200m. Brochure: -Tel. 0034 66497181. - Self-contained villa apartments, private pool, gardens, barbecue. Sat TV. Beautiful beaches. Transfers available. -Tel./Fax. 01702 202476. Tel./Fax. 00 346 5748659. - Two villas. Three and four bedroom with private pools. - Tel. 01903 714270. - Villa, sleeps 6-8, pool, beach 5 minutes. Golf nearby. - Tel. 01382 542046. - Unspoilt fishing village. Villa, sleeps six. Pool, garden. Sandy beaches. - Tel. 01737351056. VILLA. - 3 bedrooms, 2 bathrooms. Pool, beach views. May-September. -Tel. 01252 792114. - Choice of two apartments. Sleeping 4/6. Pool. 1km marina, beach, shopping, restaurants. Superb views. £50-£200 pm. -Tel. 01202240937. MORAIRA JAVEA. - Two villas, 3 beds each, with pools. - Tel. 01932 875394. - Villa 3 bedrooms, 2 bathrooms, own private pool. - Tel. 0114 2862837 (evenings); 01142758622 (daytime, 9am-lpm). - Lovely 3 bedroom, 2 bathroom villa. Private pool, barbecue. £175-£475 per week. - Tel. 01643 841165. La Nucia village, Peaceful villa, 4 double bedrooms, 3 bathrooms, TV, pool. Beautiful views, mountains and sea, - Tel. 01274564894. COSTA BLANCA. - Super villa. Pool, TV, games. 4 double bedrooms plus. From £695 weekly. - Tel. 01243 539888. CALPE. -. Old fishing village with modern extensions, 3 bed, 2 bath apartment, well furnished. Private, overlooking sea, port. -Brochure, details. Tel. 01793 790637. NEAR CALPE. - Villa, 4/6, 10 minutes beach, supermarket. £80-£210. -Tel. 0117 950 0288. DEN IA - Modern apartment. Near beach, all amenities. - Tel. 0181-6486539.
. - 2 bedroom country cottage on Finca property. Quiet, sylvan, stunning views. 5 minutes by car to beaches and restaurants. Private patio, share pool. From £250 pm. - Tel. 01424733313. - Delightful ground floor apartment, sleeps four, large pool. - Tel. 01235 535356. - Exquisite villa on pine-clad slopes. Panoramic views. Tranquil position. Private secluded pool, spacious terraces, barbecue, beautiful gardens. 4 double bedrooms, 4 bathrooms, luxury kitchen. -Brochure: Tel. 0802 403144. - Seafront. Three bedroom apartment. Pools. Close beach/amenities. - Tel. 01509881391. - Secluded villa, 3 bedrooms, 2 bathrooms, pool. Idyllic location. - Tel. 01799 530285. - Villa, own pool, large gardens. Quiet, conveniently situated. - Tel. 01222 617860. - Beautiful house, sleeps 10. Pool. Garden. -Tel. 0181-671 2261 evenings. - Five bedroom villa, sleeps ten. Gated pool. Barbecue terraces, near restaurants. Golf, beach. Suit 2 families. -Tel. 01239 8~499. - Four bedroom detached villa in large secluded garden. Private pool. Central heating. -Tel. 1372272727. - Unsurpassed views. Tranquil 2- bed apartment in private villa. Pool. Free use of car. £250-£600 pm. - Tel. 01754 610331. If you stay near the beach you'll probably have bought an inflatable PVC air-bed. When you bring it home it will sit at home in the garage or the loft and by the time you get it out next summer, it's bound to have developed a leak. Don't throw it away! The webmaster here has students to help with the gardens who sleep in tents and who are grateful to sleep on an air mattress if it doesn't leak - and ones which do leak are simply being put in a collection. They're all printed with different designs and colours and in 20 years time will be quite a collection. Some of the designs are great fun! So when you return and have with an inflatable for the collection please could you please email ? - and I'll pay the postage. - 2 bed villa, pools, satellite TV, washing machine, microwave, on Villamartin Golf, From £175. - Tel. 01322 558332. - Fully equipped house, sleeps 6/8. Very close to sandy beaches and superb golf course. From £l2Opw. - Tel. 01252 547918. PUERTO DE MAZARRON, Costa Blanca. -Villa, sleeps 8. Sea/mountain views. Pool. -Tel. 01438812409. COSTA BRAVA: 3 bedroomed villa accommodation on wooded hillside with pool, terrace and superb views over countryside to the south. Within easy reach of a sports and leisure club providing facilities for, tennis, fitness training and social activities - and more swimming. Barcelona one hour. Calonge Email the owner from here, (Netscape) or from here (IE Explorer) OR tel: +44 1522 778994. ROSAS,. - 2 apartments and villa to rent minter and summer. All with sea views. - Tel. 01803 834728 / 00 34 72 257614. 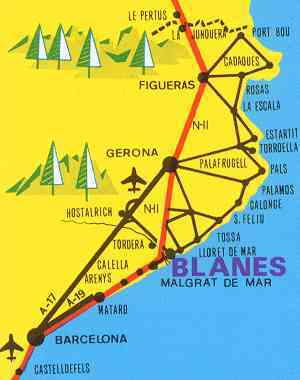 Blanes is an interesting little resort which is very handy for Barcelona (train every half hour, 5 UK pounds for a return fare) giving easy access to Girona, Dali Museum, boats to LLoret and Tossa etc. Three flats are available. Also B&B is available in a 100-year old house at a price so low I can't believe it! It's not a tarted up place - the rooms have high ceilings and style, adjacent shower/WC for every two rooms, use of a fridge and a pleasant roof terrace, and less than two minutes to the sea, markets and taxi and bus terminal. Email rogerbis@compuserve.com from here (Netscape) or from here (IE Explorer) and he'll send you further details of pricing and availability. If you like Golf, then L'ESCALA may be of interest to you. Telephone or fax Roger Thomas at 0034 972 774182 for details of his apartments there with both self catering and bed and breakfast accommodation. 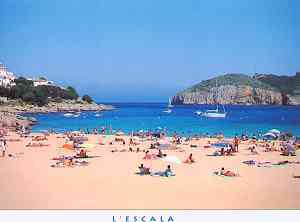 L'Escala has a good beach as well! L' ESCALA, - Old town apartment, sleeps 4 from £100 pm. - Tel. 0171-7353463. BARCELONA, CANET DE MAR. - Apartment, 4 bedrooms, balcony overlooking sandy beach. -Tel. 01424713794. Calella de Palafrugell. -Quiet spacious apartment, 2 bedrooms, pool, gardens. -Tel. 01704551430. CALLELA DE PALAFRUGELL, - Beautiful panoramic views over bay and towards Llanfranc. Quiet, spacious duplex, sleeps 6, pool and garden. - Tel. 01202 700130. L'ESCALA. - Apartments, sleeps 2/4. Owner on call 24 hours. Community pool, gardens. 5 minutes beach. - Tel. 01797 367140 (evenings). TAMARIU. - Unspolit villages, large, well-equipped apartment, pool,tennis court, 50Cm beach. - Tel. 01344 457164. - Affordable luxury villa, near sea/shops/rail, sleeps 2/6/8, Jacuzzis 1 hr Barcelona, some vacancies. - Tsl,/Fax, 01295712207. - Villa overlooking Mediterranean. Pool. Accommodates 6 comfortably. -Tel. 01722 . CANYELLES PETITES, - Luxury villa, sleeps 6. Overlooking sandy beach. Superb pool. Panoramic views. Satellite TV. Calais one days drive. - Coloured brochure: Tel. 01234 741503. MARBELLA - Beautiful 2 bed / 2 bath apartment on El Paraiso development. Ground floor with private patio and garden with direct access to communal gardens and pool. Over the road from beach. 2 minutes walk from local shops. restaurants and bars. Very close to many golf courses particularly the El Paraiso course. Newly furnished and equipped. 2 bedrooms - 1 x 5'bed 2nd with twin beds. The kitchen has hob small oven and washing machine. There is a patio reached from the lounge and the main bedroom with private small garden leading to main gardens and pool. Fans in each room. Over the road from beach. 2 minutes drive from golf courses. Keys are with an Agent o ver there. 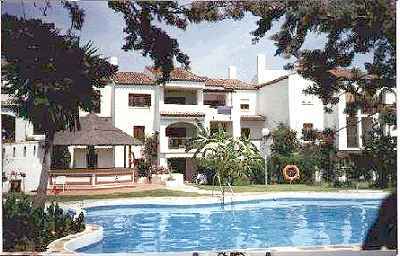 The apartment is between San Pedro and Estepona at the bottom of the El Paraiso development, 2 mins walk from local shops and restaurants etc. It is 7 mins drive from Puerto Banus, and 10 mins drive to Estepona. Tel (day) 07887 757888 (eve) 0208 907 0379 Email from here (Netscape) or from here (IE Explorer) for more details. - 2/3 bedluxury apartment, own pool. - Tel. 01462458591. NR MARBELLA, BENAHAVIS. - Mountain village apartment, sleeps 4/6, pool. - Tel. Cl 782 866566. LUXURIOUS HOLIDAY accommodation - Tel. Elise: 0161 796 9203. NEAR MARBELLA. - Luxury villa, private pool, garden. Town houses and apartments overlooking the golf course. - Tel. Hendra Spain, 01637 875778. NERJA. -2 bedroom villa. Quiet urbanisation. Cable TV. - Tel. 01622 758064. MIJAS, - Private family villa, sleeps 6/9, large pool, sun terraces/ patios, barbecue and satellite TV. Peaceful surroundings, - Tel. 01992 523953. NERJA. - 3 bedroomed detached country villa, sleeps 6, private pool. 10 minutes Nerja/ Frigiliana. Also studio apartment, Torremolinos area, Sleeps 3, - Tel/Fax. 00345211 5767. Mobile: CC 34 3993 7759. CALAHONDA, NEAR MARBELLA. A1 Lovely garden apartment, sleepe 4-5. 2 pools. - TeliFax. 0181-4404090. CAROLINA PARK, MARBELLA. - Studio apartment, sleeps 2/4. Gound floor. 2 pools, tennis court, Tapas bar. - Tel. 01342 717502. CAROLINA PARK. - Two pretty studios, lovely complex. - Tel. 01264 324276. PUERTO BANUS AREA. - Luxury villa, with private pool and garden, sleeps 6/8. - Tel. 01745 351048. SKOL. - One bedroom apartment, beachside. Two pools, gardens. - Tel. 01277 230058. - Attractive apartment, central position, close beach. Sleeps 2/5. - Telephone 0181-954 0538. Marbesa, Marbella 6 miles. - Detached 2 bedroom villa (sleeps 4-6), large garden and balcony. Very pretty, quiet location, 1 minute to beach. - Tel. 0161 7942476. Marbella / Estepona. - Sleeps 10. Pool, gardens. Close beach, Safari Park, restaurants.- Tel/Fax 003452790511. PUERTO BANUS. - 2/3 bedroom, air conditioned apartments, satellite TV. 3 pools) 1 heated), tennis, golf concessions, restaurant. -Tel. 01753 554997. VILLA CANAI in the favourite resort of MARBELLA. - Villa on luxury beach complex. Sleeps 2. Tennis, pools, bars, restaurants with superb Golf nearby. - Tel. 01959 534482. ESTEPONA, 'BENAMARA'. - 1/2 bedroom apartment. Pool, beach, tennis, children's play area, parking. - Tel. 0181- 2924160. SAN PEDRO. - Garden apartment. Pool, Near sea. Sleeps five. - Tel. 01554 757963. SAN PEDRO. - Pretty south facing bungalow with communal pool. One minute sea/restaurants. Sleeps 2/4. - Tel. 01295 780696. COSTA DEL SOL , NERJA,. - 3 bed, 2 bath detached villa, 2 bed, 2 bath pueblo villa. Studio in town. All shared pool. -Tel. 01481 832697,24 hours. TORREBLANCA, COSTA DEL SOL. - 2 bedroom, 2 bathroom apartment, large lounge, balcony. Close all amenities. Pool. -Tel. 0181-421 0187/003452 568633. - 2/3 bedroom villa, sleeps 2/8. Pool, BBQ, Cable TV. - Tel./Fax. 01491 837834. TROPICANA NERJA. - Villa/bungalow 1mile to Neria. 3 mins to beach. 2 bedroom, 2 bathrooms. 15 channel TV. - Telephone numbers: 07970 771660 or 0034 5250251. - Terraced house, attractive development. Sleeps 6. £150-£350. - Tel. 01462 634520. - Beautiful detached villa in select location. 3/4 bedrooms, 2 bathrooms, private pool, BBQ, cable TV. Maid. - Tel. 01481 832696. SAN JUAN. - Two bedroom villa, terraces, views, pool. - Tel. 01623 792823. - Beautiful 3 bedroomed detached villa, 2 bathrooms, satellite television, private pool, barbecue. Christmas or New Year package also available. -Tel. 01271 863646. - Delightful 2 bedroom villa. Sun-terrace. Garden. All amenities. - Tel. 01234 781406. - Exclusive hillside residence, spectacular views. A dream holiday. - Tel. 013967 68451. - Family villa. 3 beds, 2 baths, overlooking sea. Fully equipped. Quiet location. Private pool on complex. - Tel. 01243 514949 or 514848. - Superb 2-6 bedroom villes, private or shared pools, plus 1 or 2 bedroom apartments. - Tel./Fax. 0161 483 0451. - Well appointed 2 bedroom pueblo villa, Shared pool. Sleeps 4/6. - Tel. 01506434057. TROPICANA, NERJA. - 3 bedroom villa, shared pool. - Tel. 01225 872109, evenings. Benalmadena Costa Puerto Marina. Private luxury 2 bedroom penthouse to rent. - Tel. Gwen 0171-729 3380. NERJA. - Beautiful private house, peaceful surroundings next to sea. Sleeps six, roof terrace with shower, private residence, pools. All amenities from £200 per week, - Tel 0171-403 0900. COSTA TROPICAL - Small, select list of delightful apartments and chalets, - Tel. 0171-3793239. BENALMADENA. - One bedrom apartment, sleeps four. Swimming pool, 2 bathrooms. - Tel. 01703 693388. FUENGIROLA. - Luxury private studio in Las Palmeras. 4* hotel. Large balcony overlooking harbour. - Tel. 01308863854. - Large upmarket garden apartment, 2 bedroom, 2 bathroom. El Paraiso, San Pedro Os Alcantara. Tel. 01472813166. LA SELLA. - Villa, spectacular views. 3 bedrooms, sleeps 5/6. Pools, golf, tennis, squash, horse riding. - Tel./Fax. 01425 279496. - Luxury apartment overlooking pools. Sleeps 2/4. Golf, tennis, riding. - Tel. 01883 625146.
dining room and lounge. 5 minutes walk to town centre. 2 minutes to beach. -Tel. 0115921 7090. DISCOVER THE CATALAN PYRENEES. - Tastefully renovated farmhouse. Spectacular situation. - Te), 0034 73 25 2076. ESTEPONA, SPAIN. - Large beachfront villa, sleeps 6. For family and golfing holidays. -Tel. 01367710702. ESTEPONA. - Sunny seaside studio/ patio. Pool, gardens, Sky TV. Reasonable. -Tel. 0131 553 0227. FUENGIROLA. - Charming house, comfortably accommodates four. Bathrooms ensuite. TV. Idyllic setting, Pool. Peace.-Tel. 0151 9292209. FUENGIROLA. - Lovely large villa, Sleeps 10, large pool, gardens. Sports complex. Housekeeper and mini-bus. Villa £395+ p.w. - Tel. 01784453343. FUENGIROLA. - Picturesque villa, Sleeps 6, superb location. From £200 per week. -Tel. 017844S3343. FUENGIROLA. - Sleeps 6. Sea view. TV, large balcony, all amenities. - Tel. 01524 413785. LA MANGA CLUB. - 4 bedroom detached villa. 3 sun terraces, satellite TV, video, air conditioning, dishwasher. 50% off golf/ tennis From £450 per week. - Tel. (day) I01277632323; (evening) 01277810376. LA MANGA. - Seafront apartment. 2 bedrooms, Sky TV/radio. - Tel. 01689826158. MOUNTAIN COTTAGE, near Neria/sea. -Sleeps 2/8, pool. £175-£325 per week. -Tel. 01462 458063. PUERTO BANUS. - 2 bed apartment, sleeps 6, air conditioned, satellite TV. Five star complex with all amenities and sports. -Tel. 01622 682679, office hours only. REAL SPAIN. - Andalucian cottages. English-run. Pool/lakes/countryside. - Tel. 0181-9980381. SOTOGRANDE. - One bedroom apartment, 2 minutes beach, 15 minutes Gibraltar. From£150p.w.-Tel.0181 3468648. SOUTHERN SPAIN. - Property to let. Sun all year round. - Tel. 01428 724490. SOUTHERN SPAIN. - Sunny all year round. 1 bed fully equipped bungalow. Rates from £80 pm. -Tel. 01245325374. SPACIOUS BEACHSIDE VILLA. - Winter/Spring. Sleeps 6+. From £99. - Tel. 01638661298. SPAIN, CADIZ REGION. - 3 bedroom villa. Pool. Golf. From £300 pm. - Tel. 01509890436. If you want Golf and a good beach in Majorca then ANDRATX may be of interest to you. from here (Netscape) or from here (IE Explorer) This place is superb and one of the most sought after in Mallorca and an apartment here costs between 300 and 600 pounds per week. ARTISTS HILL TOP 6 - Bed house, pool, sea views. Bargain. - Tel. 01993 831021/01865515153. - Country villa, San Antonio, sleeps 5. Pool. Sky television. - Tel. 00347 1342933. - Villa. Glorious gardens, pool, idyllic countryside. Sleeps 4. - Tel./Fax. 003471 334901. - Villa on beach, sleeps 10, own garden/swimming pool, sat. TV. Summer or winter (CH) holidays. Tel. 01252 615186. ALCUDIA POLLENSA. S/C Apartment - owners villa. Quiet country setting, 15 mins drive to beaches. S/Pool. Sleeps 2/3. -Tel.Fax. 003471862384. CAPDEPERA. - Beautiful villa/apartment with pool. Close sea. Sleep 2-10.-Tel. 01580852251. FLOWERS HOTEL & Apartment, superb situation from £140 p.w. -Tel.Fax. 003471 657831. - Luxury three-bedroom apartment in private residential complex. Yards from the sea, with swimming pool and beautiful garden. - Tel. Mrs Green: 01222 521348. FERRERA PARK. - Comfort-able private apartment. Two bedrooms/bath-rooms. Sleeps seven. Terrace. Barbeque. Autowashing machine. Excellent swimming. Children's pool. - Brochure: Tel. Tony Greeves 01232 768078. - Exquisite luxury villa, situated on beautiful Cala with attached boat mooring/beach. Four suites (sleeps 8), air conditioned, heated terrace, pool, tropical gardens. Fully staffed, butler/cook, housekeeper, maid. - Enquiries/ brochure: Tel. 01691 610794 or email the owner from email email from here (Netscape users) or here for IE Internet Explorer users or 710760. Villa sleeps 6. Pool. - Tel. 0161 9288507. - Luxury private villa/pool. Exclusive area, overlooking sea. Breathtaking views. Sleeps 6/8. - Brochure: Tel. 0161-476 2680. 0370 808885. CALA SAN VICENTE, - 3 bedroomed bungalow, 2 bathrooms, beautiful, peaceful location. - Tel. 01635 863358. ILLETAS. - 2 bedroomed apartment. Ensuite bathrooms. Pool. Gardens near to golf, beaches and amenities. -Tel. 01206 501607. MALLORCA IN SPRING. - Almond blossom, wild flowers, sunny days, carnival, Easter festivals. House available, mountain village of Alaxo, 25 minutes Palma. - Brochure: Musselwhite, Tel. 00 34 71 879313. Answerphone/Fas. 0034 71 879180. PALMA. - Beautiful apartment. Seafront. Four-poster. - Tel./Fax. 00347168 1588. PINE WALK, PUERTO POLLENCA. -Owner's 3 bedroomed apartment. - Tel. 01473 737887. POLLENSA. - Experience Mallorcan village life. Traditional house, sleeps 2/6. Fabulous views. Near beaches, mountains. -Tel/Fax. 016286 22342. PUERTO ANDRAITX, - 2 bedroom luxury apartment. All amenities. -Tel. 003439638110. PUERTO POLLENSA, - Apartments, central position/pinewalk. 4-8 persons.-Tel. 01214532433 / 0121460 1402. ANDRAITX. Charming old country house. Well equipped. Peacerul surrounding. Own pool in secluded garden. Port Andraits & Beaches nearby. Sleeps 6. Availiable May-September. - Tel. 01422 353837. POLLENSA. - Country villa, 2 bedrooms, 2 bathrooms, plunge pool. Close golf club/beaches. Lovely valley location.-TeliFax. UK 01983862157. Spain, 0034 71 533580. PORTALS NOUS. - Beautiful apartments, sleeps 6-7. Sea view, satellite TV, private garden, pool, sandy beach. - Tel. 0181-462 7737 (day), 0181-657 3001 (eve). PUERTO ANDRAITX, Spacious apartment sleeps 5/6. Terraces, pool, beatiful scenery. -Tel. 01372801518. PUERTO POLLENSA. - Countryside villa, sleeps 6, with pool, garden. -Tel. 01344890182. SAN TELMO, - Two bedroom apartment in beautiful surroundings. - Tel. 01435872305. - Country cottage with private pool, large garden, panoramic views. Near Cala D'Or. Sleeps 4. - Tel. 01343 544317. - Two country cottages in beautiful setting, near Algaida, each sleeping 2/4 + cot. March-October. From £100 p.w. each cottage. - Tel. 01279 428463. Traditional comfortable holiday villa with private pool, set in delightful, peaceful countryside. - Tel. 0181-445 7731. NORTHERN MAJORCA. - Luxury apartment in private villa. Panoramic views, sea, mountains. Golf. Peaceful, relaxed holiday. -Tel. Wetherby, 01937 585491. NORTHERN MALLORCA COUNTRYSIDE. - Beach 2 miles. Exquisite 1 bedroom accommodation. Very private. Large garden, pool. £250 per week. - Tel. 00 347 1890270. PUERTO POLLENSA. - Seafront flat, near Pinewalk. April, May, August.-Tel. 01608661517. PUERTO POLLENSA. - 3 bedroom apartment. Secluded small block. Pool, gardens. -Tel. 01277 356094. PUERTO SOLLER. - Spacious comfortable farmhouse. Sleeps 8.50 yards beach, garden, heating. - Tel. 01483 747428. - CALALLONGA. 4 Bedrooms, 2 bathrooms, pool, harbour view. - Tel. 0181-6758070. CALA TORET, Nr Binibera. Completely refurbished 2-bed apartment -sleeps 4/5. Sea view balcony. Close to shops, taverns, restuarants and beautiful safe quiet cove. £150 - £250 p.w. - Tel. 01460 57757. DETACHED VILLA. Sleeps 2- 6. Close Mahon. No pool. Brochure - Tel. 017083 45058. CALA LLONGA. - Luxury matertront villa. Superb views. Own pool. Sleeps 6. - Tel. 01372 372274. CALA LLONGA. - Superb, south facing waterside villa with AC & CH, satelliteTVand all amenities. 3 double beds, 3 bats could sleep 10, large terrace with BBQ & own pool overlooking Mahon harbour. Tel. 0171-4056094 Fax. 0171-831 3678. CALA LLONGA. Luxury 3 or 5 bedroom villa available. Fully equippesd with own pool and marvellous views of Mahon Harbour. Also 2 bedroom apartment in San Jaime. -Tel. Julie 01722338282. CALAN PORTER. - Privately owned villa. Quiet location. Three double bedrooms, three showers/wcs, kitchen, lounge, large covered patio, solar-heated pool. - Tel. 01539433265. ES CASTELL - Apartment, sleeps 4. Furnished/equipped to high standard. Harbour one minute. Beach 5 minutes. Shops/restaurants nearby. All year round bookings. Some availabilitry July/August. -Tel. 01162672099. ESCASTELL. - Beautiful one 4 bedroom and 2 bedroom house. Harbour views. - Tel 0181-743 0649; 0171-482 2925. PLAYA DE FORNELLS. - Beautifully equipped two bedroom villa/apartment. Sea view. - Tel. 01923 774310. PLAYAS DE FORNELLS. Lovely villa. 3 bedrroms. Fantastic views. BBQ terrace, sandy beach, pool, water sports. -Tel. 01483771966. PUERTO ADDAYA. - Villa with swimming pool, 3 bedrooms, 2 bathrooms. Superb sea views. From £250 per meek. - Tel. 01666 824602. S'ALGAR. - Comfortable garden villa, prime position, good amenities. -Tel. 01737 643540. SAN JAIME, garden apartment overlooking Son Bou beach, pools, entertaiment. - Tel. 01204 882836. SAN JAIME. - Apartment, Els Girasols, sleeps 4/5. - Tel. 0113 2843433.